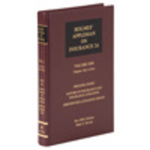 The New Appleman on Insurance Law Library Edition, Appleman on Insurance 2d and John Appleman, Insurance Law and Practice comprise an unparalleled, comprehensive analysis of insurance law across the nation. They authoritatively cover the gamut of insurance law with an incomparable number of cited cases covering all jurisdictions. The 2010 Edition of the New Appleman Insurance Law Practice Guide is the indispensable research tool that provides step-by-step guidance on each phase of an insurance coverage dispute along with strategies that help you win. Written from policyholder, insurer and judicial perspectives, this unique four-volume set combines savvy procedural guidance and authoritative analysis of the law. New Appleman on Insurance: Current Critical Issues in Insurance Law is a "hot topics" quarterly publication that addresses the most urgent challenges facing insurance law practitioners. The articles are written by practitioners and scholars of the highest caliber. The articles analyze either new and current issues or recurring, but still unsettled issues in insurance law practice. Several of the articles are accompanied by appendices that provide multi-jurisdictional surveys of the positions of state high courts on the subjects of the articles. Mootz, Francis J. III, "Volume 3, "Liability Principles and CGL Insurance," Appleman on Insurance, Law Library Edition (LexisNexis, 2010)" (2010). Books. 3.